To wrap up Slow Fashion October, I’d like to share a few of the ways I make my own wardrobe go the distance. Whether handmade, second-hand or bought new, clothing that is well taken care of lasts longer, plain and simple. I should start by saying that overall, I'm not too precious about my clothes - I just try to take a common-sense approach to getting the most out of them and making them last. When it comes to laundering, I machine-wash pretty much everything in cold and hang to dry on hangers (partly because of the limited space in our tiny shared laundry room and partly because it’s so easy to just stick them back in the closet once dry). And air drying is so much gentler on clothes than the heat of a dryer, never mind the energy and cost savings. I also try to wear things at least three times before washing - like many of us, I work indoors so my clothes don't actually get "dirty". If something needs to be refreshed a bit but isn't really in need of laundering, I hang it by an open window overnight or gently steam it. I have a sort of two-week rolling rotation where things get mixed and matched a few times before going in the laundry bin - it's not an exact science, but so far it's working pretty well. For my handmade knitted and crocheted items, I try not to wash them too often at all - a good airing out (outside if possible) is usually enough to freshen up a woollen sweater and get rid of any odours picked up from the environment. When I do wash my wool, I use the dedicated wool cycle on my washing machine with a very small amount of mild wool soap (such as Lopi Wool Soap), and then lay the item flat to reblock and air dry. Dry-cleaning I keep to an absolute minimum - reserved only for coats and heavier items, and usually only once a season when these kinds of things are coming out of or going into storage. So that's it in a nutshell - pretty basic really and as I said, common-sense ways to stretch the mileage of the things I own. On another note, my unofficial challenge this month was to wear at least one handmade and/or second-hand item of clothing every day, not including accessories. I’m pleased to say that I managed pretty easily. Now that Slow Fashion October has wound down, I’m planning my winter closet re-organizing session and looking forward to taking stock and seeing what I’ve got with fresh eyes. And finally, I’d like to thank Karen Templer from Fringe Association for providing this platform for anyone with an interest to explore and share ideas about what slow fashion means to them and how they approach it in their own lives. I’ve been following conversations on Instagram and elsewhere and have enjoyed seeing so many different perspectives. It’s definitely got me thinking even more as I try to articulate my own (sometimes contradictory) thoughts on this important topic and work to become a more conscious consumer and maker. I have been trying over the last few years to reduce the amount of things, especially new things, that I buy. Living in Iceland, it’s not all that hard for me to forgo clothes shopping for months at a time, mainly because things are just so expensive here. On the other hand, given that Icelanders ranked 8th out of 37 countries in Europe in terms of volume consumption per capita last year, it’s safe to say that Icelanders love to shop, and it’s as difficult here as anywhere to avoid the idea that consumption equals happiness. One of things I’m working on the hardest is to think more carefully about what I’m buying - not just where it came from, but whether I really need it in the first place. Where I can, I try to buy from sustainable brands, but the truth is, that’s not always easy or within my budget. For some of us, it’s difficult to avoid fast fashion entirely for exactly those reasons. The fact is that I still buy mass-produced clothing from time to time (usually on sale), though much less often and, more important, less overall. I limit purchases to items that I know will last and that I’ll wear for much longer than a season or two, and I use basically the same rules as I do for buying second-hand: I have to have space for it, it has to fit well, and it has to be well-made, no matter where I’m buying from. I don’t feel too bad about having a good few “fast-fashion” items in my closet that I’ve had for years and that still serve me well. I’d love to replace them with more sustainable options one day, but as long as they’re still wearable, I don’t see the need. And that’s essentially what slow fashion means to me, I think - it’s not just about buying from sustainable brands or small-batch designers and makers or natural, ethically sourced materials - it’s also about critically assessing our needs and wants, buying less and making the things we already have last longer. I recently became obsessed with KowTow, a sustainable brand from New Zealand that's available here in Iceland at Org Reykjavik, a great source for sustainable clothing and accessories brands. Farmers Market is a favourite Icelandic slow fashion label, as is Doppelganger Collection. Aftur (which means again in Icelandic), makes innovative deconstructed designs from upcycled materials. I discovered Toronto brand Hoi Bo two summers ago and am still in love with the linen shift I bought from their Distillery District shop. For new fibre, I really only buy Icelandic wool - a local, natural and sustainable resource. Ístex is the biggest manufacturer (for where to buy online, check out my FAQ page), but there are several smaller brands by designers, spinners and dyers - among them Helene Magnusson, Einrúm and Hespa - that are definitely worth checking out. I’ve always loved old clothes. As a teenager I used to regularly lift items from my parents’ closets - fitted blazers from my mom and beat up old work jeans from my dad. In my twenties, I could spend hours sifting through the racks of dusty attic vintage stores searching for that one great find. I still love the thrill of the find, and over the last couple of years I’ve begun to notice that many of my best-loved and most-worn pieces, are, in fact, second-hand - either thrifted or swapped or given to me by family and friends (the robe in the picture belonged to my grandmother and is probably my most cherished piece) - which makes me feel good for many reasons, not least because it’s one small way to extend the life of perfectly good items of clothing and keep them out of landfill for just a little while longer. 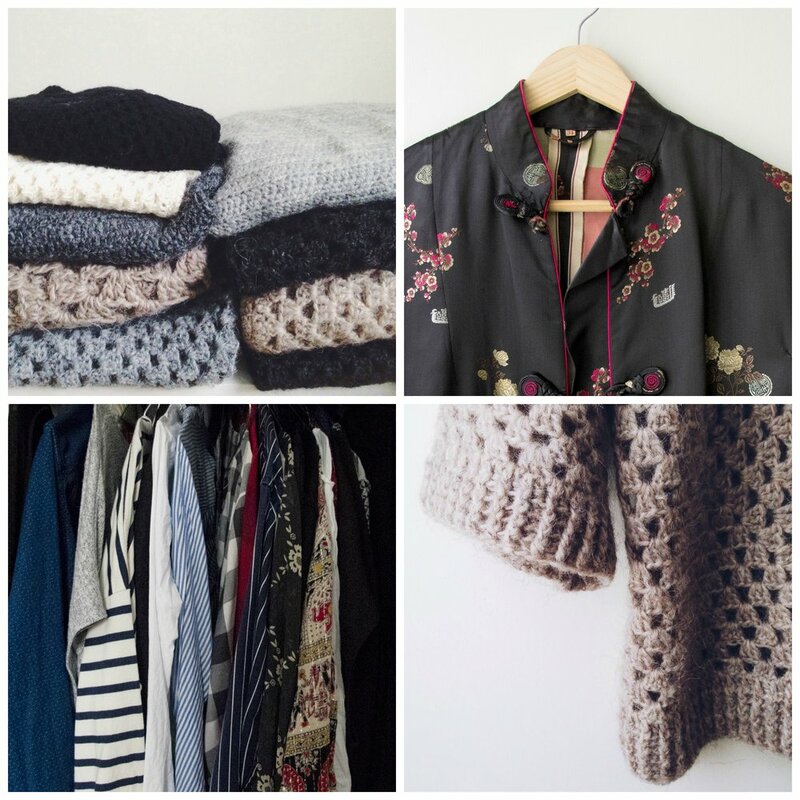 This week’s prompt for Slow Fashion October is how, so I thought I’d talk a little about how I incorporate second-hand into my wardrobe. As with buying new, one of the main issues for me is the sheer volume of things we consume and discard, and making an effort to reduce that consumption overall. So my first rule is this: It has to fit into my closet and my life. I’ve bought many vintage items over the years that I wound up giving away because they just weren’t “me”, and as much as I loved looking at them, I never wore them. Now I’m much better at knowing what works for me and what doesn’t, and I look for things that suit my own style - classic, understated, neutral - and that go with the pieces I already own. That doesn’t mean I can’t make space for something special, but it has to be wearable and fit into my existing wardrobe. I regularly reorganize my (very small) closet, which is a great way to take stock of existing items and identify holes. Rule two: It has to fit. I know myself, and I know that if it doesn’t fit properly it will stay at the bottom of my closet waiting for the day I take it to a tailor - and that day will never come. If you’re someone who is great at altering or remaking clothes to fit you, that’s wonderful (and I do hope to get there one day when I have more free time), but if not, I don’t recommend buying something that doesn’t fit properly, no matter how cheap it is. And finally, rule three: Quality. I look for good quality fabrics, particularly natural fibres like wool, that don’t show too many signs of wear. Replacing buttons or making small repairs on an otherwise great piece is no problem, but I avoid things that look especially worn out, faded or permanently stained - when I buy something I want it to last, regardless of whether or not it’s brand new. Second-hand clothing is not without its downsides. For one thing, donating clothing often lulls us into a false sense of “doing good” with little thought as to where that clothing goes or what impact it might have beyond the donation centre. It is still, after all, a linear process. That said, buying second-hand prolongs that lifecycle, which is undoubtedly good thing, especially if it reduces our demand for new clothing and materials overall. And we all have to start somewhere. It’s week two of Slow Fashion October, and this week’s prompt is what: What form slow fashion takes in our wardrobes, what we’re doing differently than before, and what we’re working towards. For me, these questions tie in perfectly with what I’d wanted to talk about this week anyway: handmade. I’m a maker. Since childhood, I’ve found great joy in making something with my own two hands, and the excitement of taking an idea out of my head and into the real world never diminishes. Handmade has long been part of my life and my wardrobe, and for me, it’s what comes to mind first when I think of slow fashion - made by hand, slowly and intentionally and with care. The handmade items in my closet, especially the ones given to me by loved ones, have meaning and are worn and cherished far more and far longer than anything else I own. That said, I don’t sew my own clothes - my handmade pieces are mostly knits and, because I live in a country where it’s nearly always sweater weather, they get worn a lot, some repaired repeatedly. But as I’ve begun to think more deeply about sustainability, I also can’t help but question some of my own assumptions and practices when it comes to making. I guess that’s the “what I’ve been doing differently” part - thinking more about materials, more about process, more about impact. The deeper you look, the more apparent it becomes that even the most well-intended choices can have far-reaching negative impacts and knock-on effects that are difficult, if not impossible, to fully comprehend. It’s almost paralyzing sometimes and lately, as my yarn stash and pile of samples continue to grow, I wonder whether I’m simply justifying a different kind of over-consumption. Sure, it’s handmade, but at the end of the day, it’s still just more stuff after all. And isn’t that the real problem? As I try to build a handmade business, I find that I'm struggling to balance the goals of sustainability with the realities of commerce and living on an island where most things have to be shipped or flown in and out. What I’m working toward now is to try to be more conscious of the choices I can make and remember that small steps are better than no steps. For me that means using local, natural, sustainable yarns that aren’t overly processed, and sourcing other materials and supplies as responsibly as I can with the knowledge and resources I have today. I’m lucky to have access to amazing yarns that are grown and produced right here so that’s my starting point, but eventually I’d like to incorporate recycling in some way as well (I've been following Reunion Yarn on Instagram and am so inspired by what she’s doing). I’m also working to improve my design process (read: math), as well as other processes, so I can make fewer samples and reduce waste. Even more than slow, maybe what I'm really trying to work toward is just… less. I understand that not everyone has the means or access to buy more sustainable materials or make their own clothes or even buy handmade - I know I can't (and don't) do all of that all of the time. For most of us it comes down to doing what you can, when you can. But one thing most of us participating in this conversation can do, regardless of income or socioeconomic status, is to consider not just what goes into our closets, but how much, and where and when we can, make it a little less. I can’t believe it’s almost October! The summer, the year really, has flown by so fast. I’ve spent a lot of time this year thinking about sustainability - part of the reason I launched Rove Handmade was to explore how I could build something cohesive around making more thoughtful choices in my craft, and sharing that with others. So I’m excited to join in on Fringe Association’s Slow Fashion October this year. The prompt posted on the Fringe Association blog today for the start of Slow Fashion October is who - who are we and who influenced us to think differently about our clothes. To answer, let me first make a brief introduction: I’m Maria and I’m a Canadian transplant to Iceland. I design crochet patterns mainly using Icelandic wool and I also work full-time for an apparel company. As for who influenced me, there are a few. First, Karen Templer and Fringe Association for sure - I have followed the Slow Fashion October series since 2015, and the stories and discussions around the topic of slow fashion have really helped the seeds of this idea take root in my mind. I've also been lucky to have these discussions with friends and coworkers (and working in apparel brings the topic into even sharper focus), one of whom co-owns a slow fashion knitwear label herself called Doppelganger Collection. But if I go back further, my mother and grandmother are probably bigger influences than I even realize: When I was young, my mom sewed clothes for herself and us kids (incidentally, that sewing machine is sitting in my parents’ basement, still in perfect working order after 40+ years), and my grandmother literally wore things out - repairing and repairing again rather than discarding. This is what I’m thinking about right now at least. I don’t have all the answers - in fact, I mostly have questions. There is so much to consider that it can feel like an overwhelming and impossible subject to tackle, but Slow Fashion October is a great opportunity to at least start to think about what sustainability and slow fashion mean to each of us, and how we can make positive changes in our own lives and wardrobes. Me, I have a long, long way to go, but I’m glad to have at least begun the journey. Here we are at end of the month, and I didn't do as well with my Slow Fashion October challenge as I had hoped. I had big plans for thoughtful blog posts along each week's theme and daily Instagrams of handmade wares (and wears), but it's been hard to find the time to sit down and write something of substance about a very broad, very important topic. I challenged myself to wear handmade every day this month, and while I managed to at least wear handmade accessories every day (that part was easy as we moved into scarf, mitts, and woolly socks territory), handmade garments were more difficult. I had…OK, I put...a lot on my plate this month, so getting creative about what to wear in the morning just wasn't - and if I'm totally honest, isn't ever - within my operating capacity. However, I would like to share one of my favourite pieces that gets regular rotation, not just for Slow Fashion October but all through the year. The hand-knit Icelandic lopapeysa in the pictures above was given to me by my mother-in-law a few years ago, knit by her sister-in-law (my husband's aunt), and I have practically lived in it ever since. It's been repaired once already and is due another round now that I've somehow, inexplicably, made a hole in the armpit. Considering it's fragility (it's made from single-ply, unspun plötulopi) it's held up remarkably well, and to me, the patches and repairs only add to its charm. I wore this sweater a lot this month, along with a few other well-loved pieces, some handmade and second-hand and some bought new over the years. It was well made, in good fabric. It was not super-cheap, even on sale, but was within my budget. It had classic styling and would last more than one season. Perhaps I rationalized a new mass-produced purchase simply because I wanted the coat (I had already tried it on twice in the weeks before it went on sale). But I have worn it every day since I bought it and I know it will serve me for at least a few more years. At the same time, I still want to avoid new mass-produced as much as I can and that includes craft supplies. I use Icelandic wool almost exclusively in my work mostly because I love it, but also because I know where it comes from and where and how it's produced. Which brings me back to my overall goal of being a more conscious consumer and making a better effort to fit a slow fashion philosophy into my lifestyle. It's hard, and there are no easy fixes for a system that not only exploits people but also harms our environment. How did we even get to this place? To me, the question has more to do with our core values as people and societies than with factories or corporations. These core values, after all, are the ones driving us to want more, faster, cheaper; driving corporate CEOs to prioritize profit above all else, no matter the human or environmental cost; and driving the kind of unsustainable consumption we're seeing now. But I'm optimistic. The slow fashion movement is growing and gaining traction, and I do sense a shift, perhaps still driven primarily by niche communities like makers, but a shift nonetheless, in our values and priorities. People who didn't think about these things before are thinking about them now, and that's good. All I can do is try to be more aware, to consider more deeply not just what I buy, but why I'm buying. And get my sewing machine fixed. I can do that too. Fall is upon us once again and the days are rapidly getting shorter, wetter, windier, colder. I've been noticing how much darker it is when I get up in the morning and how much earlier I need to turn on lights in the evening, and can't help being reminded that winter is just around the corner. The thing I love about fall though, besides brisk days and bringing out the woollens, is that sense of a fresh start that I always feel so much more in September than in January. This fall I've been taking stock - of wants vs. needs, sustainable vs. unsustainable, intention vs. action. In a general sense, I want to give more, need less, and spend my time and money on the things that really matter to me. More specifically, I want to buy less and buy more consciously. I'm hardly a spendthrift to begin with, but I know I can do better when it comes to the cycle of cheap, fast, and disposable that's so easy to get sucked into. And I want to make more - I used to sew my own clothes way back when and I'd like to get back to doing more of that too. That's why Karen Templar's Slow Fashion October project over at Fringe Association couldn't have come at a better time. Karen is hosting a month of, well, consciousness-raising is sort of the way I see it, to help us think and talk about sustainability and what it means to us. Anyone can participate in any way they want to, but Karen has provided some helpful prompts to explore a different theme during each week in October. So to begin, a little bit about me: My name is Maria and I'm a crocheter. I learned to crochet at 12, taught by my grandmother's neighbour. I studied fashion design at college and worked as film and TV costumer for a decade and a half before taking a "proper" day job. In that time, I've always found time to make - for myself, for friends, and sometimes for strangers. Oh, and I live in Iceland, the land of the lopapeysa, where it is nearly always sweater weather! I don't have a particular project in mind for this slow fashion month (I already have a few things on the go), but I have made a pledge to myself to wear something handmade every day this month. And I'm going to get my sewing machine fixed!